Michael Abela Photography...and how to make money out of it! - Make Money Online! Michael Abela Photography...and how to make money out of it! Are you one of those photographers with hundreds of photos on your hard drive? Would you like to turn those dormant photos into cash? There is a simple and easy way to turn your photos into money online and its called...DigiCamCash! An Easy Way to Sell Your Photos and Making Money Online! Digital photography has introduced a whole new breed of photographers in the sector. The digital era has changed the way we look at photography. One of the immediate effects was that digital photography has made it more easy to shoot, view and download your work in minutes. This has resulted in more and more photos being stored in our hard drives. In reality many of these photos we do never utilize them. So why not turning these resources into money? I am sure that many of you have never considered this option. That is what I would like to share with you, how to make money by selling your photos online. There are many straight forward ways, by which you can turn those dormant photos in your hard drive into cash. 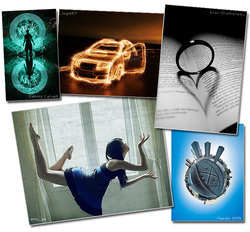 An easy way is by selling them through the various microstock photographic library sites. Some might think it is complicated, when in fact it is quite simple. Before grabbing your camera bag and heading to your quest, I would suggest you go through your stored photos, on your computer and pick those photos that in you opinion have got potential. I advice you start by selling these, in order to get the feel of the whole system. Eventually you would want to shoot more specific photos related to the sector you are passionate and feel confident working in. A crucial aspect of this business is editing. Your photos should be up to market standards. Photos should be sharp, saturated with vibrant colors and they have the best possible composition. Needless to say exposure should be flawless. Nowadays there are many editing software to choose from on the market, any imperfections can be corrected easily. What is so exciting about selling photos online is that this is a lucrative system. Once you have uploaded a photo in your library, it is there to be sold over and over again, generating automated income in your account. You can be sipping coffee at a café or sunbathing next to a pool and you are still selling photos 24hrs round the clock! Remember the internet never sleeps. If you are committed, you can easily turn photography from just a hobby into a part time or even full time job. For other seasoned photographers it is another way to generate extra income. What makes this system so attractive is that you can set your own working hours depending on your life style. I invite you to grasp this opportunity as you have nothing to loose but everything to gain. I recommend that you take action and start making real money online, doing what you have been always doing i.e. shooting great photos. If you want to get a piece of the cake and make real money online I suggest you have a look at DigiCamCash. Do not get lost in the noise all over the net, go straight to a reliable source. This book will lead you step by step, on how to set up your online system and turning your everyday photos into money. If committed, you can easily turn photography from just a hobby into a part time or a full time job. You can easily make up for the little fee you pay for this book, by just selling one fantastic photo! I invite you to grasp this opportunity as you have nothing to loose but everything to gain. How about standing out from the crowd! How about adding that cutting edge to your photos! In today’s competitive market putting in some special effects in your photos would put you in the forefront, ahead of the crowd. By adding that little extra to your photos, you can create more creative and imaginative work. Original work always sells better. Microstock sites are always on the look out for original work. Do not just point and shoot, but plan your way for that perfect photo. If you would like to educate yourself about some really special effects to enhance your photos, I recommend taking a look in here Trick Photography and Special Effects by Evan Sharboneau. It is a source full of valuable information that can help you turn good photos into spectacular ones. If you are serious about putting in that little extra in your photos I sincerely believe this is a must.